Tailored levels of calcium and phosphorus help promote optimal joint and bone growth DHA, an Omega 3 fatty acid clinically proven to help promote smart, trainable puppies Prebiotics work in your puppys digestive tract to help support his natural defenses No artificial preservatives, flavours or colourants added 100% complete and balanced Product Description Large and giant breed puppies grow so quickly, but controlling that growth is critical for their proper development to adulthood. 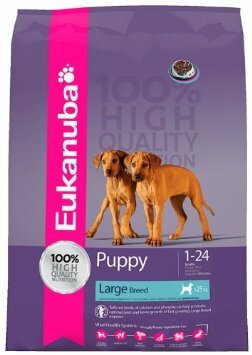 Eukanuba Large Breed Puppy has been specially formulated to nutritionally support the muscular and skeletal development of large and giant breed puppies. Eukanuba Large Breed Puppy contains precisely balanced levels of calcium, phosphorus, protein and fat to help promote healthy bone growth. It also contains natural sources of Glucosamine and Chondroitin Sulphate and as a whole supports healthy joints that can be stressed by a large-breed puppys growth and weight. Eukanuba Large Breed Puppy is also made with natural fish oil to deliver enhanced levels of DHA (docosahexaenoic acid) for optimal brain development and a smart, trainable puppy. FOS, a natural Prebiotic, is included to support your puppys strong defenses from within the digestive tract. Eukanuba Large Breed Puppy also has appropriate levels of fiber to help aid digestion and help your puppy have appropriate stool volume for easier cleanup. High Quality Ingredients Our highest quality ingredients are purposefully formulated to provide 100% complete nutrition with 0% fillers. Chicken is our number one ingredient to build and maintain lean muscle mass for top body condition. Guaranteed calcium and phosphorus to promote optimal joint and bone growth of fast growing large breed puppies. This food naturally provides high levels of Glucosamine and Chondroitin formulated to help support healthy joints. No artificial preservatives, artificial flavors, artificial colorants, gluten or fillers added. If 9kg size sacks are out of stock we will send you for eg: 3 x 3kg bags to complete order.